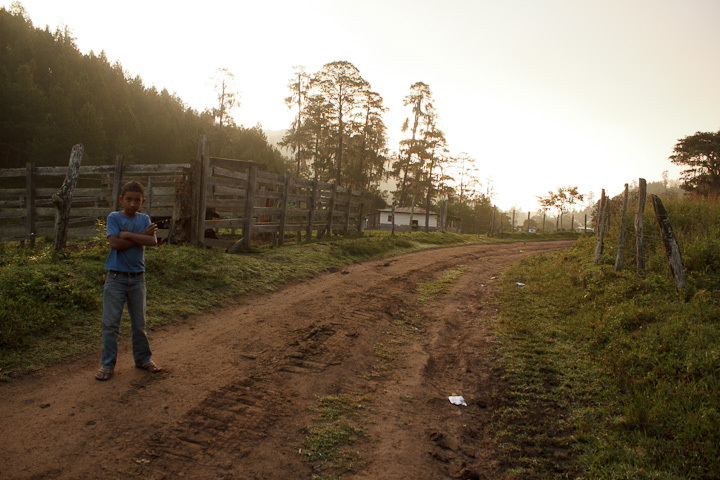 So Catherine, Isidro Zuniga, and I finally got out to the field this past week, and ended up in a small hamlet outside of Gualaco. We were guests of some incredibly hardworking people, so we tried to work hard as well, cramming 54 kilometres of trail walking into just 3 days. We decided the best thing to do would be to do some walking, mapping and call playback to get the lay of the land, and to figure out where these birds might be. 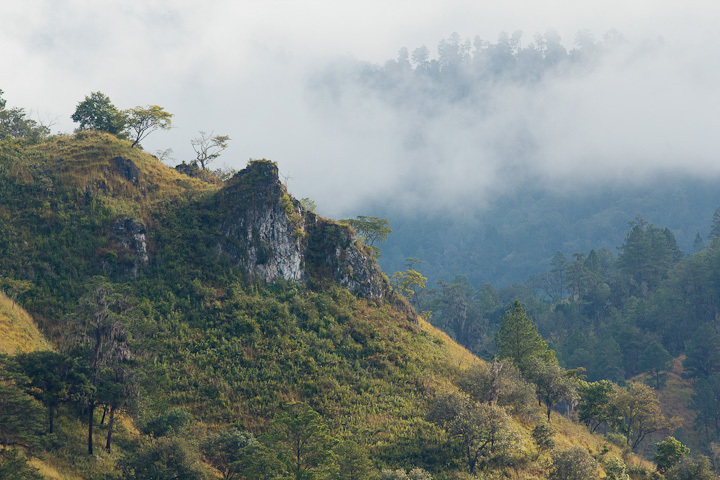 We had informants everywhere, as the people are often working in the forest, tending cattle, cutting pine or maintaining small milpas on the hillsides. At the end of our first long day of walking, we got a hot tip that we had missed seeing a group of caracaras by a couple of hours in the morning. The next day we headed out in the direction of the previous day’s sighting, and along the way got further info steering us to a valley just south of the town. We walked about a kilometer down the valley and did a call playback. 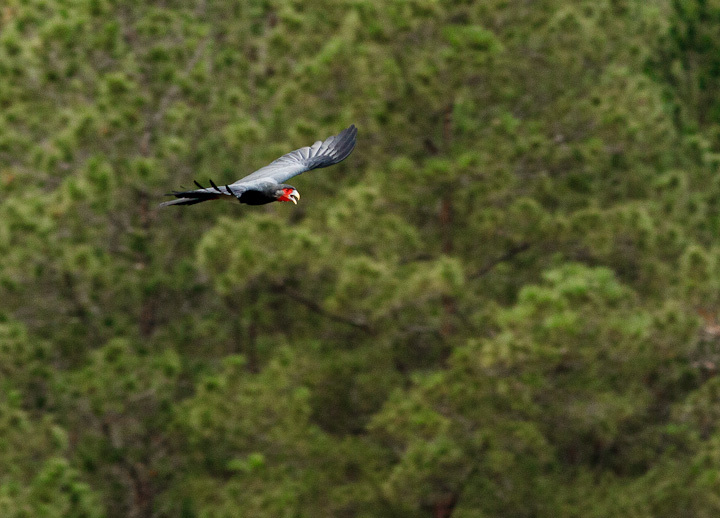 Soon enough, we heard a distant group of caracaras to the southwest. Being unsure of whether it was a true reply or not, we scrambled up a large hill on the south side of the valley, and played back another call. 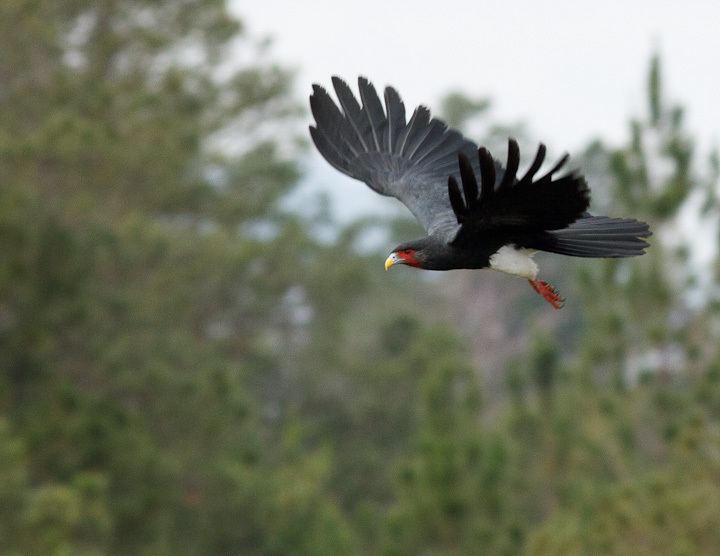 Within a minute, three caracaras came screaming in within 20 metres of us, loudly contesting what they presumably perceived to be a territorial incursion. I managed to get some good pictures and observations in, finding that these Ibycter americanus guatemalensis are not much different from the South American I. a. americanus, and their supposedly larger stature is not very evident in the field. The behaviour was identical to what we had seen in French Guiana, except that it was all occurring in a mid-elevation pine forest full of people, cattle and anthropogenic alterations. 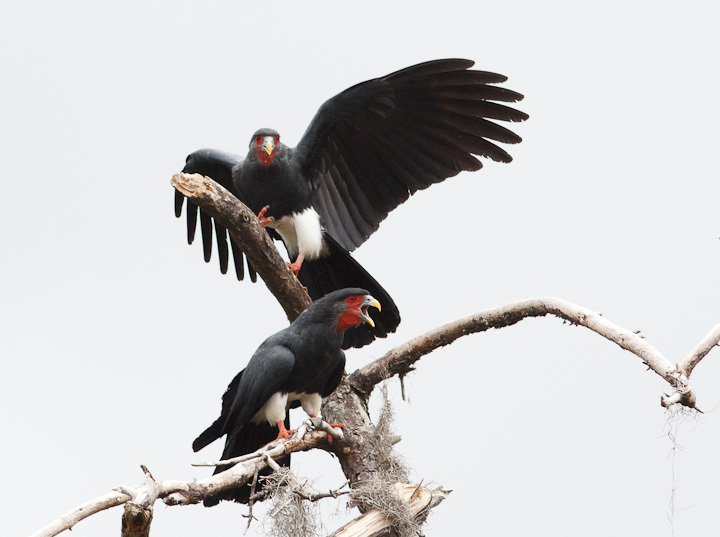 These three caracaras were later joined by at least two others, making this a group of 5 or more birds. In all likelihood, these are the same birds that reared a chick last year, although if that is the case, there should be 6 (assuming there has been no mortality or emigration). The major revelation of this trip, however, came from the interviews we did on the fly with people out working in the forest. 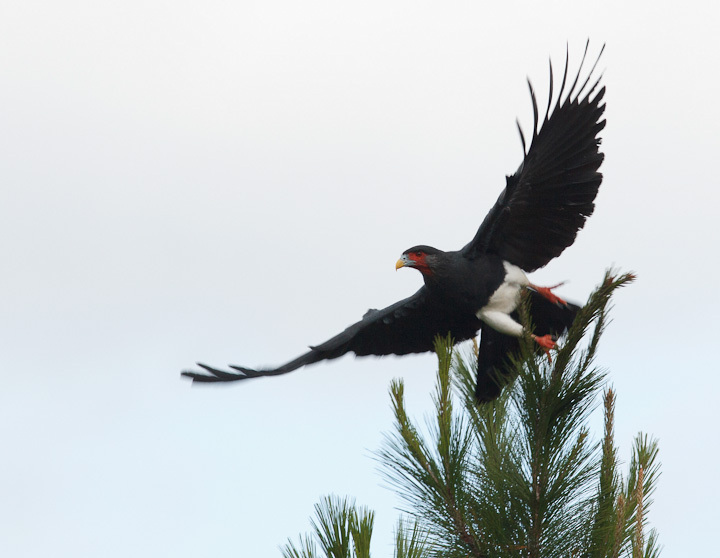 It seems, at least initially, that these birds have much larger territories than the ones in South America, and may cover distances of 6 km or more during daily foraging. Considering the difficulty of navigating the terrain (it is steep! see below! ), It worries me quite a bit that our planned radio tracking project will be very difficult to carry out, at least from the perspective of distance. While we may not have the insanely thick vegetation and radio attenuation of the rainforest to deal with, the terrain is very rugged, and chasing these birds down over large distances is going to be physically very challenging…Not to mention, radio attenuates very steeply when it hits rock! Enough griping! I will lay out the specifics of the work situation in a later post. 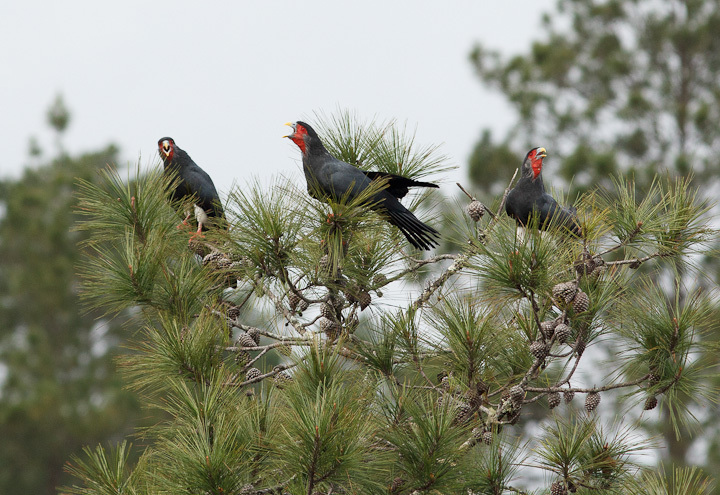 For now, please enjoy these images of the extremely rare Red-throated Caracaras of Honduras! Beautiful birds in a rugged location,. Looks like lots of hard work ahead! I am somewhat dreading it! But it will get me in shape anyway. These photos are GORGEOUS! # 6 is spectacular – just waiting for entry to a photo contest. #8 looks like a painting. Hope your research goes smoothly and if the data you collect is equal in quality to these photos – it will be awesome! I can’t promise anything WRT the data…But we will try anyhow to get something worthwhile. Beautiful pictures, just so clear and beautiful. Good luck in your research, Sean. The pictures are great and the terrain looks like a real challenge. This is an amazing discovery and commitment to the species! Thanks to all involved. Looking at the photos you can almost hear their (not so quiet) vocalizations. Great shoot, I like 3, 7 and 8 pic. Congratulation for this moment. Stunning photos. Thank you for sharing this adventure. 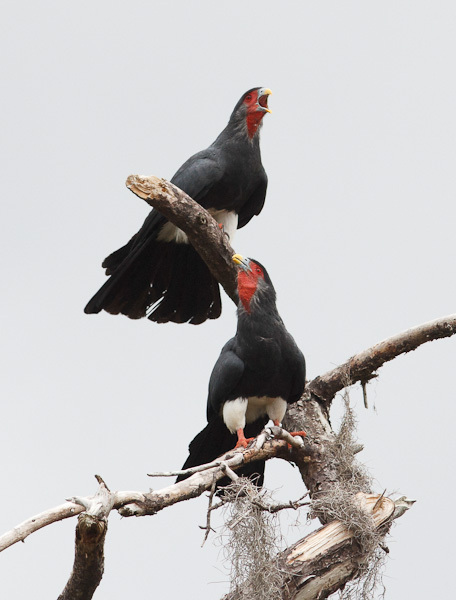 Best photos if Red-throated Caracaras I have seen. Congrats on the cool project and findings.